more like sheetmetal shed sailboats. Fixing up and sailing a cold molded Carol sloop. A page for wooden boatish musings and projects from Timber, Oregon, a small frontier town filled with bears. new floor boards (x2, the first set broke as I was installing them so I started over with leftover teak parquet from another boat). Re-install rudder, install tiller, all new hardware. New sink drain with pump to get water from the sink overboard. Photo evidence, with some non-boat stuff first. Finished the sleeping porch – it’s quite nice and a prototype for the “Hyla Hut” project- simple pre-fab cabin kits entirely from FSC certified, local, happy, free range, hand hewn wood. Slight work interruption with a sea kayak trip to Isla Carmen near Loreto BCS. Warm water and beaches in Baja. Back to work- “gull grey” paint with non-skid on the decks and cockpit. New to me wood stove when my parents replaced theirs. And after 4 hours of dealing with stovepipe issues, it’s working. New running rigging and genoa tracks- splicing thanks to my mom! Final paint and varnish on the hull and cockpit. The brightwork on the cabin was previously painted over, but is quite beautiful mahogany. Another view of the completed paint and varnish, prior to bottom paint. And about what she looks like today, although the bottom is now painted and the shop much cleaner. More to come soon, with her in the water! First off, happy fall equinox! It’s been a week of firsts. First rain of the season, first coat of the final paint color on the Carol, first fire in the shop stove, and the cabin, for the year, and first time (maybe) tensioning the drive belt on our mill- a true breakthrough! Boat progress has been slow and steady, and as always, I’m uncovering more projects as I go. I purchased Chuck Paine’s e-book on boat designs, and through the emails asked him about keel bolts, which have been on my mind as of late. He agreed with me that simply adding a few won’t hurt, so another addition to the list. In measuring the mast I also discovered that it may be 1’6″ taller than designed, and that the boom fittings are severely corroded. The plan is to make up some composite fittings to keep corrosion at bay- a good winter project, and potentially add 2 shivs to the end of the boom to facilitate running reef lines inside the boom. Finally, due to a cabin project, work, and the potential of other sailing, I’m leaning towards a summer 2019 launch, allowing me to slowly pick away at remaining projects and not launch her half baked or rush anything. We’ll see. It sure would be nice to get out and sail her. In the meantime, a few boat pictures (beginning and end) and a lot of tangents (mostly wood related). First fire of the season in the shop stove- warming it up for the first coat of varnish on all surfaces (from rudder head to coamings and sheerstrake). Quick detour over the confluence of the Colorado and Little Colorado in the bottom of Grand Canyon. You can see some smoke on the north rim. The Alaska Air pilot flew right down the San Juan from Bluff UT all the way down the Colorado to Lake Mead. Cedar for the backrests in the cockpit. The final color- Interlux off-white with the varnished mahogany sheer strake. She’s starting to make the barn look a bit shabby. Only 7 more coats of varnish and 3 more coats of paint to go! Plus the bottom paint, boot stripe, decks, etc. I really should get rid of that outboard mount. And my main distraction- a little timber framed sitting spot. Structure forthcoming. One of my favorite boat info outlets, Off Center Harbor, seems to be pretty fixated on slowing down this summer. If you haven’t visited their site, you definitely should. I’ve taken that to heart this summer. Hence, very few Carol pictures, and more pictures of other boats. It’s smoky here in Oregon, still hot, and I’m re-learning that boat work is about sanding, sanding, and then sanding some more. Our bi-annual Waldathon only accepts pretty boats. This one is a cedar tripping canoe that I built in highschool with wood from our family business, Hyla Woods. And my sister in her Pygmy kayak on a beautiful glassy morning. Nice spruce oar in the foreground from Shaw and Tenney. Late night in the barn. She looks a little pockmarked from sanding the second coat of primer. She’s nice and fair now though and ready for off-white topsides paint. The brightwork all got a first coat of varnish yesterday. And the best way to get rid of the last piece of hardware that I couldn’t get off. Cut it apart with the angle grinder. It turns out that the screws weren’t seized in the wood, but instead the stainless had seized to the aluminum cleat. No amount of heat, knocking, penetrating oil, etc, could get it loose. Progress has been slow and steady these last few weeks. Final sanding on the hull before another coat of primer, selection and purchasing of paints, picking up the rigging, fitting the backing plates for the thru hulls, and painting the interior. Most of all, lots of daydreaming about sailing, calm anchorages in British Columbia, will the outboard be functional? Should I just sell it and buy a new mainsail? Needless to say, a quick overnight backpacking trip got me thinking about these finer, and further in the future, details. And for the colors, I decided against bianchi green, phew! She’ll have an off-white hull and a gull gray deck, with everything else finished bright. Isn’t that varnish beautiful on the stripped and sanded main cabin hatch? Now just imagine it with a polished bronze deadlight. No need to imagine! And new plexiplass to boot. Drilling holes in the hull shows a cool cross section of 3 layers of epoxies western red cedar. Hopefully the final coat of primer. Rudder finally removed- why didn’t I do that earlier? Before and after on the deadlights. A different kind of boat- ready for a few weeks off and about. I also finally decided not to paint the hull the same color of the Carol the same color as the deck of Wallowa! The greatest success of recent memory- I can’t think of the last time that all of the trailer lights worked, and particularly not the right turn signal. Countless hours with a multi-meter, re-attaching all the grounds, etc, no progress. Turned out that all they needed was a new plug. I guess I got new wiring out of the deal, and can merge right. And finally, a geriatric dream boat in Astoria. Let me know if I can borrow this thing when I’m 80. Must weight absolutely nothing based on the hull form. Hull primer sanded and sheer strake taped off. And a coat of epoxy on the sheer strake. Another shot of the epoxy and partially sanded rudder. Edges on the hatch plexiglass beveled and new ports cut out. Forehatch frame constructed and Buoy Beer drunk. The hatch will have the plexiglass applied to the top, overhanging the edges slightly, using 3M VHB tape and metal fasteners. Was going to go more traditional, but a traditional hatch with the inset light offers too many ways for water to intrude. The ever-important sitting spot for looking at the boat. Every shop needs a good sitting spot and comfy chairs (these ones are particularly comfy and cool though). And finally some tangents. First, a pretty sad looking Carol that I tracked down in a yard in North Portland. The hull looks like a mess, fiberglass with significant deformation. Very nice Merriman hardware though. The yard just got title to her and will sell in the next month, but they are unwilling to sell any of the sails, parts, etc. What a bummer. I’m almost tempted to buy her, salvage all the parts, and then cut up the hull. And a very cool boat that came through Portland- very french, very aluminum. Tara expeditions. 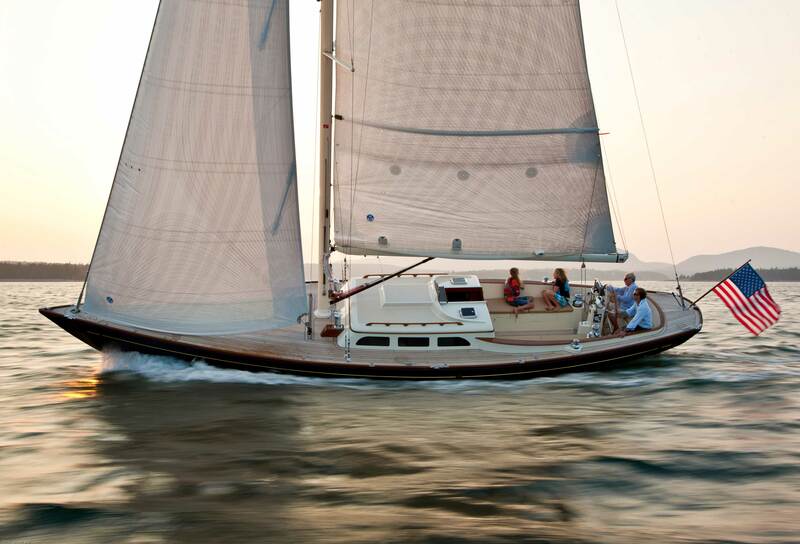 Image from Morris yachts website. Lissome, the Frances that I grew up on, reaching along, I think in Australia in the mid 80s with my mom on the foredeck. And at anchor somewhere in BC or SE Alaska, with netting on the life lines to keep little me from falling overboard. So, those were professionally built boats with hand laid fiberglass hulls. They were built exceptionally well, but were really built for cruising in the relatively protected waters of Maine or the Pacific NW. A few people, like my parents, went a bit nuts and they have since been cruised all over the world. They did have some issues, like flexing bulkheads and the trunk cabin coming loose from the deck. Overall though, they are incredibly tough and well designed little boats from a unique and thoughtful designer, Chuck Paine. Most of the Frances’ had small trunk cabins, however a good number were built flush decked. I don’t know that I could tell a flush decked Frances from a Carol if I just saw it at the marina. A handful of Frances’ were custom built either out of flexible fiberglass panels or cold molded in cedar, like our Carol. Chuck Paine is still around and has a great blog where you can see his paintings, and read his musings on selling million dollar boats to wall street schmucks. The Carol was never commercially built, so I assume they were all cold molded, although some weird molding took place with fiberglass in the 80s. If you went out to build one of these boats today it would be prohibitively expensive, between labor, materials, and yard space. Most people wouldn’t bother with it, but apparently the 70s and 80s were a bit different. She’s a bit like glorified camping, with hunched headroom and a small cockpit. Two quarterberths and a cramped v-berth round out the accommodations. I was much better at keeping to-do lists on the last few projects, but am getting there with this one. re-finish, paint, varnish all surfaces. get a new mainsail, the jib from Banks looks great. figure out a way to move the chain aft to center weight in the boat. find perfect bucket for sink since it no longer has a drain (replaced with depth sounder). And the final to-do: go sailing! currently the hull has a first coat of primer as does the deck. The interior is half painted, and all of the epoxy / fiberglass work is pretty much done. Some inspiration from the Carol sistership Jeannette- I particularly like the back rests and plan to make myself a set. 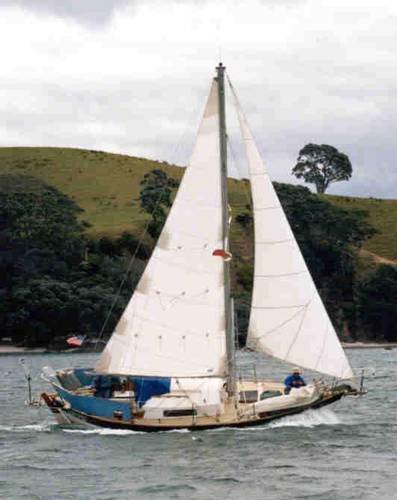 I also plan to copy the forehatch, and may need to make myself a new mainsail cover. I already made a new tiller, since the old one was warped about 6″ over it’s 4′ length. A little bit more inspiration, I’m ready to be here! I don’t know who owns Jeannette, but she sold just a year or two ago in southern BC. While I had the chance to do a thorough inspection before purchasing Spirit of Aurora, issues and projects will always crop up on an almost 40 year old wooden boat. Luckily, to date, knock on wood, none have been too surprising. The inside of the beautiful cold molded WRC hull, before painting, varnish, etc. Deck delamination and water damage is visible at the top of the picture. Our Carol is cold molded out of 3 layers of Western red cedar with Mahogany sheer-strake that has always been finished bright. The stems are both clear VG douglas fir, the deck is douglas fir plywood sheathed in fiberglass, and the deck beams are also Douglas fir. The keel also appears to be laminated Douglas fir, and the interior is marine ply painted white with mahogany trim. 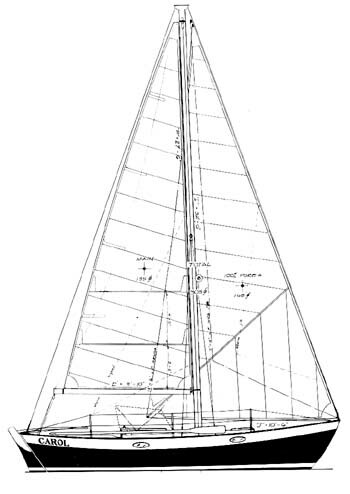 sailplan in need of updates, in particular a yankee (100% high cut jib). And I’m sure that there were more. She was definitely sail-able when we got her. 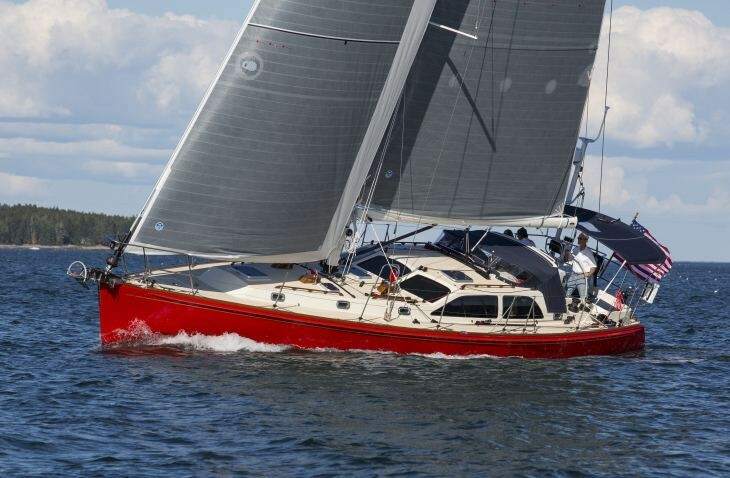 She only had a huge genoa and a spinnaker, along with a fairly rough but serviceable main. Structurally though, she appeared entirely sound with no rot to the hull, just to areas of the deck and extensive areas of the cockpit. So I got to work, with lots of help from family and friends. First, sand and grind off many years of non-skid deck paint, including some aweful rubber stuff, to get back to fiberglass and epoxy. In places with delaminaton or rot, I just kept going until I got to something solid and then got it dry and saturated with epoxy before building back up with layers of epoxy filler and glass. The deck once fully sanded clean. The cockpit needed some more major surgery. This is about half way through chasing the rot. It’s now all been replaced with Meranti hydrotek plywood, glassed, and faired smooth. Once painted, you wouldn’t know it wasn’t original unless you opened a hatch. And sanding, sanding, sanding and more sanding. Enough that my sanding vaccum went belly up mid project and had to be temporarily replaced while it got fixed. I think that I’ve filled about a dozen vaccum bags with sanding dust. The entire hull has been sanded smooth, epoxied wherever there is exposed wood, and then faired with epoxy fairing compound. The interior got entirely sanded to prep for new white cabin coat paint (thanks mom), the deck and cockpit are entirely sanded down to fiberglass and re-faired, and the woodwork is in the midst of being sanded. Unfortunately it’s not very inspiring work, so I don’t have many pictures. More in the next update. Well, there used to be a blog. Then we had some tech issues, sold the boat, and voila, a new blog. Aquavit was a beautiful nordic Folkboat that we found in Astoria, OR in the fall of 2015. 2.5 years later, she had lots of bits and pieces replaced, we had honeymooned on her, and another opportunity came up and she moved on to another home. 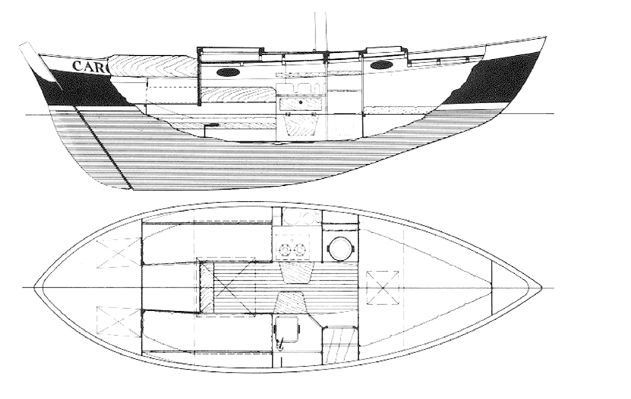 Enter the Carol, a 24’4″ Chuck Paine designed cruising boat. I found her completely by chance on a late-night Craigslist or 48 North wooden boat searching spree, breaking up the mundane boredom of real life. I had no immediate plans for another boat, but these boats are exceptionally rare, the price was (barely) within a realm I could think about, and she’s almost a sister ship to Lissome, a Chuck Paine Frances (rumor has it that he names a lot of his plans after ex-girlfriends) that my parents sailed all over the place in the 80s, including to New Zealand and Australia. I grew up on that boat, which is a 1.5′ longer big sister to the Carol, and have always had a love for adorable, double-ended small cruising boats. 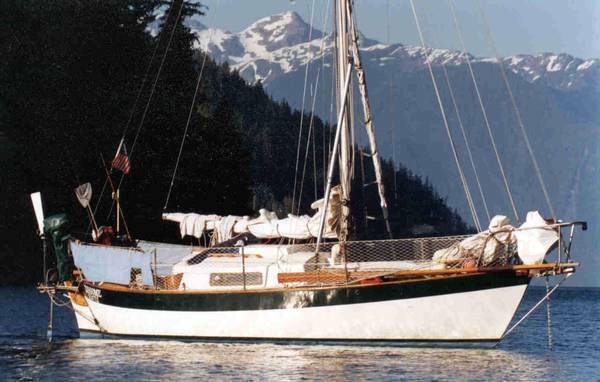 Our boat was built on Lasqueti Island in British Columbia and completed in 1982. There is another Carol floating around with similar details, also built in BC, that we expect may be a sister from the same builder. My parents were nice enough to go up with an envelope of cash, did an out of water inspection, sealed the deal, and then spent a week sailing around the San Juans. This was followed by some excitement with a corroded thru-hull, best recounted over a beer. As the first snows fell in 2018, my dad and I loaded up a large trailer with a welded cradle and headed up to rescue the boat from the yard. In the meantime, our forest business had a renter move out, opening up a barn where I could work on her, quite the upgrade from Aquavit’s jurry-rigged hoop house. Spririt of Aurora being lifted in the snowy yard on Lopez. The lead in her keel, 47% of her total displacement, was making me very nervous with how far back the travel lift straps were. Loaded up and almost ready to go, very, very cold. And backing into the barn after the ferry ride and 4 hour drive from Anacortez south to Timber. What a relief to make it safe and sound. The only casualty of the drive was a fore-hatch that came off somewhere along the way (yikes). Next up, the to-do list.